Students who have appeared class XII (CBSE/ICSE) or +2 Sc/Com/Arts (CHSE) or its equivalent examination from any Govt.recognized board are eligible to apply. Interested applicants are required to apply online through our website ,www.dsbm8.org.Candidates must go through the detail instructions before applying online. Application forms can be collected from the Office by payment of Rs 500 in cash between 10:00 am to 5:00 pm on working days. 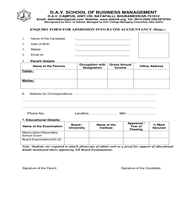 Interested applicants can download the application form and send it to the Office with a draft of ` 500 in favour of “D.A.V School of Business Management” payable at Bhubaneswar. 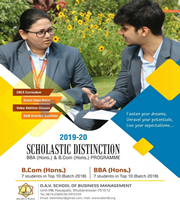 D.A.V School of Business Management comes under SAMS (Student Academic Management System) Admission System, Department of Higher Education, Govt. of Odisha. 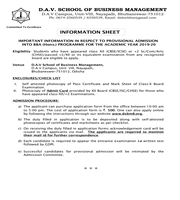 Students who have appeared (+2 / XII) examinations are eligible to download the enquiry form and send it to the Office to get further assistance for online admission into B.Com programme under www.dheodisha.in. Interested applicants can meet the Counsellor between 10:00 am to 4:00 pm on working days.